We’re proud of all our alumni and love to keep up with all the amazing things they’re doing in their communities. Today, we check in on two biology alums to see what they’ve been up to since graduation. 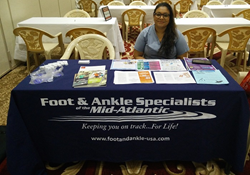 Hetal Kathrotiya-Mago ’07, biological sciences, and ’08, psychology, now a podiatrist with Foot and Ankle Specialists of the Mid-Atlantic, recently volunteered at a D.C.-area charity health fair to educate attendees about podiatry and proper foot care. Marquis Walker ’08, Ph.D. biological sciences, has been appointed to the Morgan State University Board of Regents by Maryland Governor Larry Hogan. Dr. Walker, who received his undergraduate degree from Morgan State, has been a postdoctoral fellow at Johns Hopkins University’s School of Biological Chemistry since 2008, and has also taught biology at Howard Community College. Keep us up to date by submitting a class note!